Racing to Rio 2016 | Racing to Rio is far more than the journey of a few elite athletes striving for world records, gold medals and personal bests. Racing to Rio is the story of transformation from individuals overcoming personal challenges to become world-class sailors and heroes who inspire others to face their challenges and live life to the fullest through the sport of sailing. 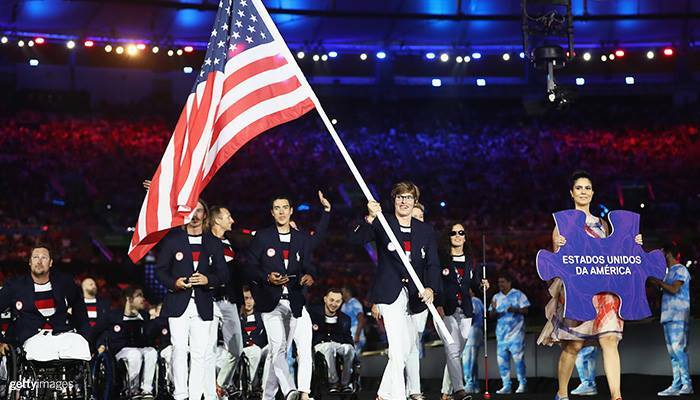 Racing to Rio is literally about Brad Kendell's journey to the Paralympics in Rio 2016, but also serves on a larger scale as a metaphor for all people who face challenges and how they can take on life to win their own "races" by being the best they can be. After a long flight back from Rio de Janeiro, Brad returned to a huge crowed of fans waiting for him at Tampa International Airport, including many officers and members of the Clearwater Yacht Club, friends, family, and news crews from local CBS affiliate, channel 10 WTSP, NBC affiliate WFLA Channel 8, and Bay News 9. It was a exciting and emotional time for all. Now help us complete our film, so we can share this story of courage, dedication and achievement with everyone. Support the movie, Racing to Rio, with your generous, tax deductible donation. Click here to donate. Finishing in impressive fashion, USA Sonar takes 1st in the final race to take the Silver. One second behind was New Zealand who just missed the bronze to CAN. Congratulations to USA’s Rick Doerr, Brad Kendell and Hugh Freund and to Canada’s Paul Tingley, Logan Campbell and Scott Lutes. In every way, every sailor in Rio is a bonified Olympian. The struggle, the hard work, the intensity, the goals, the determination. These athletes are athletes, through and through. Each and everyone of them is different, better, and more for competing. And to compete at this level, one is truly a world-class athlete. Making it to this level is recognition of extreme talent, dedication and drive. Making it to the podium is the extreme mark of achievement. Race hard, sail fast. You are our champions. Day Four – Holding onto 2nd! Only two out of three races held today, race #9 postponed till tomorrow. The USA boys took a 7th and a 2nd. Our friends on the Canadian team, skipped by Paul Tingley, have moved into 3rd. Australia extends their 1st place lead to 11 points. Keep sailing fast, my friends!